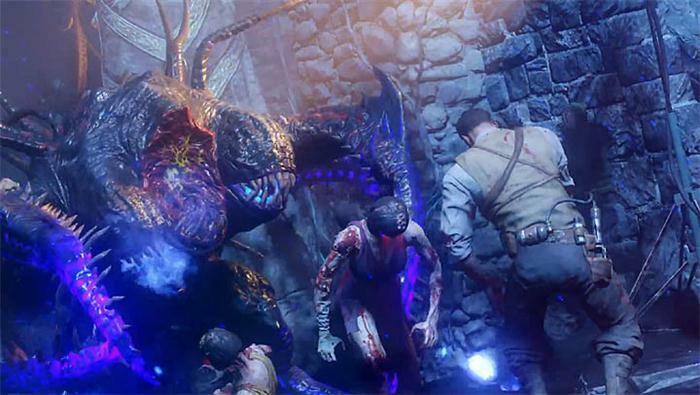 The first official gameplay trailer for Black Ops 3 Revelations has arrived, divulging even more secrets about the final zombies map in the series. 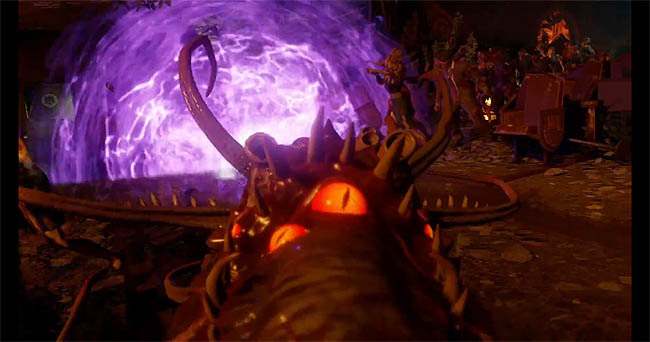 We know for sure that the map will include the Apothicon Servant, DG4 (Gravity Spikes) and the return of Lil Arnies. From the teaser images, trailers and memories segments we know that Revelations is the final battle against the Shadow Man; a case of good vs evil as the original four characters fight off the invading Apothicons. Samantha's once peaceful house and surrounding area have been smashed to pieces, along with a number of other classic maps including Shangri-La, Kino der Totem and several others. It's now a mash up of several areas, with the PaP, essential perk machines and wall buys spread across several isolated areas. In this post I'll break down the new features and some of the not so obvious ones hidden in the trailer. There's always something new to learn with each and every trailer from Treyarch! 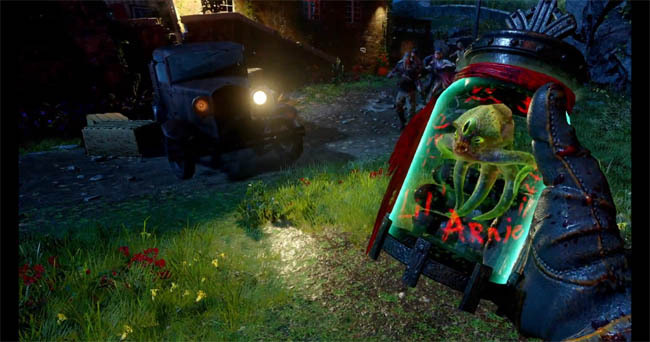 First appearing in Shadows of Evil, these Monkey Bomb alternatives are certainly cute and just as deadly. Once thrown the little tentacle beasts escape from their jar and grow into something much bigger, slicing up nearby zombies, giving players a strategic play close to dead ends or corners of the map. Shown at timestamp 0:40 and used by Nikolai to stop a group of zombies in the spawn location. The original Wonder Weapon from Black Ops 3 that was included in the Shadows of Evil map. This Apothicon weapon has caused some controversy because of it's inability to be upgraded (without glitches). Blundell always promised us that this weapon would eventually be upgradeable and with the release of Revelations it may be time! Shown at timestamp 0:53 and used by Nikolai in the Kino theatre room. One my favourite specialist weapons from Der Eisendrache is coming back in Revelations. This rechargeable utility weapon can either be smashed into the ground causing massive shock waves or planted temporarily as a trap to kill nearby zombies. Richtofen runs and smashes the DG4 into the ground at timestamp 01:05 in what appears to be the Der Eisendrache anti-gravity room. A very hard one to spot (and differentiate) but by the look of things we will be seeing the KT-4 in Revelations. For a brief moment at 00:47, Nikolai shoots what appears to be a liquid substance through the electric trap and in the general zombies direction. Given it's light blue appearance and the fact we already know that other BLOPS 3 wonder weapons are returning, this pretty much confirms the KT-4 rather than the Sliquifier (BLOPS 2) or other new weapon. Shangri La, Kino, Buried, Der Eisendrache and Mob of the Dead maps spotted throughout the trailer. We can now confirm that these maps have changed in appearance and are playable sections of Revelations. 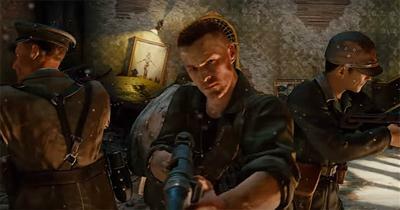 For example, in Kino the mounted MG has been removed and the background has been replaced by the Primas characters holding the Origins staffs. Considering that all of the wonder weapons have been from past maps we can speculate (and hope) that Treyarch have purposely shown these areas to avoid spoiling any of the new Revelations weapons. Will they won’t they?? It’s a longstanding theory that the staffs would make a return before the end of Black Ops 3. Blundell even said himself that they would make one final appearance. There are two trains of thought from the trailer. The first believes that the large image shown in the Kino section is a reference to the staffs and this was a troll attempt by Blundell. The other school of thought suggests that the staffs will be usable and I tend to sway with this theory. The reason I strongly believe that they’ll be back is down to the image shown above. It’s a map of Revelations that clearly shows the five distinct areas of the map: the House, Pyramid, Beacon and Church. In the center of the image there are four staffs, hovering above what appears to be a ritual area. My belief is that the staffs will be obtainable by collecting the necessary parts, which have been scattered in each of the classic maps and then performing the ritual to rebuild the original Primus versions. Visible for a brief moment at 00:20 the Hell’s Retriever weapon is thrown, leaving the telltale red stream behind. The Hell’s Retriever weapon is a supplemental utility weapon which acts like a boomerang when thrown; cutting through zombies and then returning to the player. First appearing in Mob of the Dead, hence the significance now that we know Revelations has a Mob of the Dead playable area, the Hell’s Retriever was earned by feeding zombies to three dog heads. Much like the “feeding dragons” step in Der Eisendrache, the retriever was later claimed from a secret area that opened up upon completion of the step. Certainly one of my favourite weapons in the series.